On April 28th-29th prepare to be entertained and amazed by what can only be imagined as the “Renaissance of Railroading.” This festival is a celebration of the steam engine, railroading, antique tractors, vehicles & engines, vintage wares & oddities, unique performances, early transportation and culture mixed with a bit of Steampunk fun. There will be live steam locomotive train rides, a Fillmore Citrus Packing House Caboose Ride Adventure, Dr. Solar’s Gypsy Wagon Medicine Man Show, Gene West – The Toymaker, antique carousel rides, creative vendors & artisans, unique exhibits, movie props, live entertainment, food & more! There is no other family festival quite like this one. So mark your calendars for one of the biggest events in the little historic town of Fillmore, CA! Who is Fillmore & Western Railway? 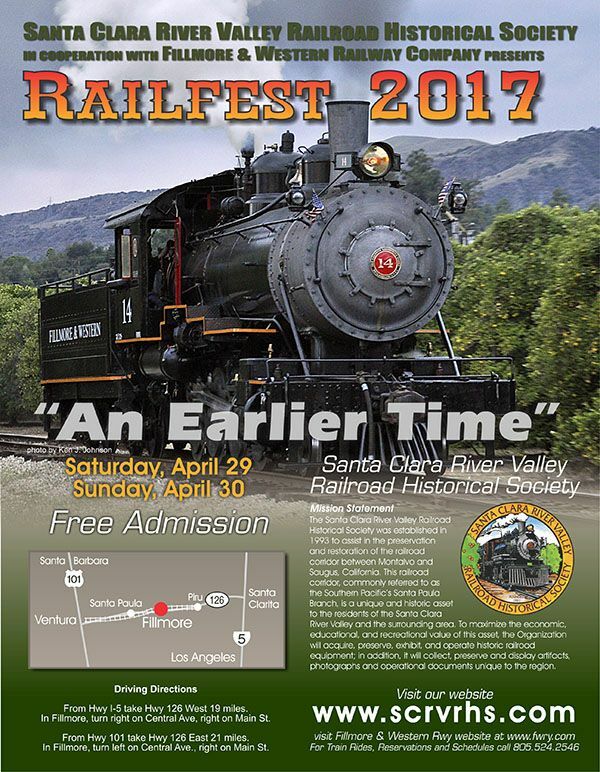 Santa Clara River Valley Railroad Historical Society, Inc.